ConnectCode barcode fonts enable barcodes in office applications and softwares that support text display. It ships with an Encoder that can create images out of the barcode fonts and an Add-in for Excel that creates multiple barcodes from a column list. It supports symbologies such as Code39, Code 128, I2of5, ITF14, EAN 13 (European Article Numbering), EAN 8, UPCA (Universal Product Code), UPCE, UCCEAN, GS1 Databar, MSI and Codabar. 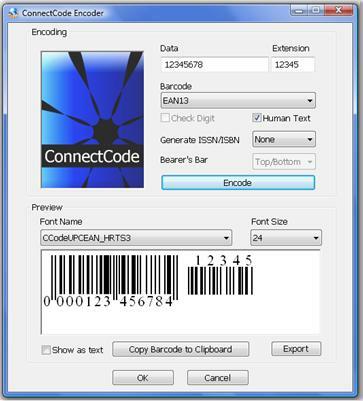 ConnectCode ships with an Encoder that can create images out of the barcode fonts and prepare raw data into a form suitable for barcode encodation. Additionally, a variety of tools, applications and source codes are provided to ease integration with third party products. This includes a Microsoft Office Macros, Crystal Reports Formulas, Excel Add-In and Windows Presentation Foundation samples. The fonts support symbologies such as Code39, Code 39 Extended, Code93, Code 128 Auto, Code128A, Code128B, Code128C, I2of5 (Interleaved 2 of 5), ITF14, EAN 13 (European Article Numbering), EAN 8, UPCA (Universal Product Code), UPCE, UCCEAN, ISBN, ISSN, MSI, Codabar,GS1 Databar 14, GS1 Databar Truncated, GS1 Databar Limited, GS1 Databar Expanded, GS1 Databar Stacked, GS1 Databar Stacked Omni, GS1 Databar Expanded Stacked, UPC/EAN Extension 2 and Extension 5 barcodes. Qweas is providing links to ConnectCode Barcode Font Pack 8.1 as a courtesy, and makes no representations regarding ConnectCode Barcode Font Pack or any other applications or any information related thereto. Any questions, complaints or claims regarding this application ConnectCode Barcode Font Pack 8.1 must be directed to the appropriate software vendor. You may click the publisher link of ConnectCode Barcode Font Pack on the top of this page to get more details about the vendor.